Super Stock Rookie by Will Weaver This is the second book in The Motor series. When Saturday Night Dirt, the first book was released to help promote it and literacy, Weavers publishers Farrar, Straus and Giroux co-sponsored his super stock car the Bookmobile Though I haven't read Saturday Night Dirt, I was still able to enjoy Super Stock Rookie. Trace Bonham drives a stock car on a small Minnesota track. He has a chance to try out for a large sponsor Team Blu. Trace is a little suspicious of their motives and unsure if he's willing to leave his friends and family behind. Patrick is smart on and off the track. The car is Patrick's instrument, his ears can pick up any trouble under the hood. The author does an excellent job describing the fast paced action on the track allowing the reader to visualize the race. Weaver writes a very good story and yes the strength is in the races but he doesn't neglect character development and a story line. Young fans of vehicular speed sports will love Super Stock Rookie. 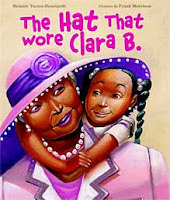 The Hat That Wore Clara B. by Melanie Turner-Denstaedt, illustrated by Frank Morrison. Its the third Sunday of the Month, Mother's Sunday, a tradition in some Black Baptist churches, when all the older ladies sit up front wearing their stylish hats. Clara B. is always excited about Mother's Sunday she dreams of wearing her Grandma's special hat. Clara B sits right behind her Grandma in church following the movements of the hat. Today Clara B. got all the moves just right, she takes this as a sign that today is the day to wear the hat. She spends the rest of the day by her Grandma's side waiting for her opportunity to wear the hat. I am a huge fan of Frank Morrison's artwork. All of Clara B's emotions are expressed in her eyes. Morrison has illustrated a beautiful contemporary and fashionable black family. The Sunday hats are gorgeous, and he doesn't slack on the other accessories or clothes. There is a lot of detail, which adults should appreciate. When reading this or the ninth or tenth time, there will be something knew to admire, like Clara B's mom earrings or her dads suit. When I saw Morrison was the illustrator my only question was would the author be able to match his bold, beautiful and bright images. Turner -Denstadet does just that and then some. The story has a beautiful flow, suspense (when and how will Clara B get her hands on the hat), mishap and resolution ( Clara B accidentally steps on the hat) The ending is beautiful, it will make you sigh and say awwwwwww how cute. I loved The Hat That Wore Clara B. "Drying while Grandma washed, Clara B. peeked at her Grandma from the corner of her eye. Did Grandma know the Clara B. was going to be worn by the hat? She frowned at the dishes in the sink. She ought to be worn by the hat! She'd done all her Sunday moves perfectly swaying when the hat swayed, nodding when the hat nodded, tipping way back when the hat tipped back. Finally, all the dishes were clean and Clara B. stepped away from the sink. " March 27-28 Ashley Bryan will be in town, along with author Sharon Draper and illustrators Frank Morrison and Higgins Bond. The Tequila Worm by Viola Canales Sofia comes from a close knit family. This is her story from a young girl to adult hood. The chapters are short lyrical, funny, sad, and wonderful glimpse of a Mexican girl growing up in Texas. It reminds me of The House on Mango Street by Sandra Cisneros. Sofia's family is very important, the author proves this point by fully developing these characters. Canales tells a beautiful story. From the start I liked Sofia somewhere in the middle I fell in love with the character. I still have no idea when it happened, though I do why, because the author had me emotionally invested in Sofia. I'd thought I take a little break, and do a little commercial venting. Though I'll begin nice and easy, with the Tim Gunn and Heidi Klum commercials. I have nothing against either but they remind me of how much I miss Project Runway. I don't want to see Tim Gunn selling Tide, I want to see him in the work room saying Make it Work. I don't want to see Heidi Klum selling diet coke, I want see her air kissing someone, Auf Wiedersehen. And I miss Nina Gracia and Michael Kors. Now the reason for this post and the venting. I absolutely hate the Pizza Hut commercial where they fly the pasta over to Italy and serve it at a fancy Italian restaurant. All the patrons love the food and they're really surprised its Pizza Hut. Every time I see that commercial I am like really get the F out of here. I am not asking for truth in advertising but thats just beyond ridiculous. You expect me to believe Italians can't tell the difference between fine cuisine pasta and Pizza Hut pasta come on now. I don't know who is worse the person who came up this idea or the one who gave it the green light. Molly enjoyed the satisfying pop the ball made in Lonnie's mitt and the little puff of dust that wafted from it. It was a pressure situation and all that, but that little puff of dust just seemed beautiful all by itself. It was something that even Coach V, as meticulous a scorekeeper as he was, had no symbol for. You'd have to write a poem about it, a haiku maybe. Girl Overboard by Justina Chen Headley. 15yr old Syrah Cheng dreamed of becoming a professional snowboarder then she blows her knee out. Syrah's parents and step parents cast very large shadows. Her father Ethan Cheng is a billionire, many people strive to do things the Ethan Cheng Way. Before the accident, snowboarding defined Syrah and she had freedom on the slopes. Now Syrah must figure out what she wants and learn out to fight for it. She finds peace in her manga journal. Syrah's story doesn't begin with her, its a continuation, Headley shares the stories of her parents as well, like what happened to her mother when the communist took over China. I loved Headley's writing and really enjoyed Girl Overboard. Syrah finds a new path, learns how to forgive herself and comes back stronger. I'm tired of being a Que Syrah Syrah girl, the one who's left behind in the cold snowdrift of memories and pretends that's okay. The girl who's too afraid to read about someone else's adventures because it magnifies how distant her own dreams have become. On my stepstool, I reach for the topmost shelf where I've stashed my video resume. The CD case in my hands feels too slight to contain the best minute and fourteen seconds of my snowboarding tricks. I really enjoyed every story. They were all complete short stories, with no unexplained jumps . Ten different author and ten different styles but they all worked. The little time I had with each character I was able to fully lose myself in their stories. Some of the main characters were players others spectators but each author takes the reader closer to baseball. Girls are not forgotten, they are there playing as well as the boys. In Tomboy Forgiveness by David Rice its the mom who is playing. In Great Moments in Baseball by Paul Acampora the mom screams and yells in the stands like a professional. 1) Mark Pang and the Impossible Square by Frank Portman. The author turns a 3 second play into a well crafted and great 16 page short story. 2)Smile Like Jeter by Maria Testa. The author tells her story using poems. The main character is a catcher and plays violin with his dad. Poetry, baseball and music, what more do you need? 3) Baseball Crazy by John H Ritter, the main character recalls his baseball crazy friend from little league. The baseball stories are slightly unbelievable but aren't all good baseball stories. Baseball Crazy was originally released in 2008, it is now available in paperback. The season is almost upon us, and I've been craving baseball books, so in the next few weeks you'll be seeing more baseball reviews. And if anyone knows how I can get an arc The Brooklyn Nine by Alan M. Gratz I would really appreciate if you'd you'd let me know. Normally I wouldn't ask but I have baseball reading fever. Hey just wanted everyone to checkout Color Online, They're running a promotion right now if you link to them you'll be entered to win a free book. Check out the Prize Bucket . They have a new feature called COLA Color Online Love Alert. I don't know about you but I love, appreciate and respect a good acronym. COLA is beyond good for that alone you should check out Color Online. Mexican WhiteBoy by Matt de la Pena This book was deceptively good. Diversity Rocks. When I got close to the end, I couldn't help but put the pieces together again and truly appreciate Matt de la Pena's writing and the story he told. 16yr old Danny lives in San Diego with his mother and younger sister, Julia. Danny feels like an outcast because his dad's Mexican and his mother White. When Danny's dad left the family, Danny shut down emotionally and only speaks when he must. He also begins to dig his fingernails into his arm, so much so that he has scars. The only thing he enjoys is pitching. Danny is spending the summer in National City with his dad's family. In National City Danny still feels like he doesn't fit in only this time he's a few shades too light. He'll being staying with his aunt and uncle and hanging with his 17yr old cousin Sofia. Danny hopes to get closer to his Mexican roots and maybe it will bring his father back. On his first day in National City Danny meets Uno the only other half Mexican, Uno's father is Black. Danny and Uno's first meeting ends in blood and stitches but the two become very good friends. In the beginning of the summer Danny practices his pitching alone until Uno becomes his catcher. Uno convinces Danny the two should challenge the best hitters on every team for cash. Danny is no ordinary pitcher, he's a born talent. So it should be easy money but Danny can't find the strike zone. He had the same problem trying out for his high school team. In practice everything was great but against hitters Danny can't find the strike zone. Uno tells Danny to stop thinking so hard, and getting in the way of his talent. Danny has a lot going on in his head like his dad, will he ever come back?, why he left?, or memories he can't remember and there's still more. Once Danny stops letting everything weigh his mind down, he and Uno run through the best hitters in town. Danny's magic on the mound. Uno knows Danny's bound for greatness, he's simply happy to have known him before. Baseball is a small part of this book. Its more so about Danny coming to terms with who he is and who is dad was. In Danny's actions and few chosen words, I could see how much he missed having his dad around. Throughout the book Danny writes his dad letters about what's going on in this life in hopes that maybe one will make him come back. Everything Danny writes is a colorful untruth, instead of running a summer hustle with Uno, Danny's an ace for a traveling team. It isn't until the end that Danny learns the truth and there is no way his dad can come back. The author spends a fair amount of time on Uno as well. For a while the chapters alternate better the two characters. This is one of those books a few days afters you've finished it you've realize how good it really is. Mexican WhiteBoy was chosen as a 2009 top ten best books for Young Adults by YALSA. Tales From Outer Suburbia by Shaun Tan As much as I loved this book, I lack the words to describe how great this collection of short stories is and if I try I'll simply embarrass myself. So I'll keep it short. Its simple, complex, everything in between, beautiful and every time I revisit a story it makes me say damn all over again. If I ever meet Shaun Tan I would almost be tempted to go SNL old school because I am definitely not worthy. Now go read a review better yet just go buy the book . Sport Science This is a show that comes on Fox Sport Net (FSN) In a lab plays and myths are analyzed. Like who hits harder Rugby player or Football player? Or Do goalies really have cat like reflexes? Professional athletes will stop by to help with an experiment. Ben Roethlisberger, Jerry Rice and Jennie Finch have all been by the Sport Science Lab. Everyones brain works differently and you never know whats going to inspire a student to take an interest in a subject they never cared about before. You're so good at reading Tortoise. Tortoise gives in and Hare uses a leaf as a blanket. In the corner Tortoise's large mug of tea goes cold. The best thing about the mug, the chip in the corner. Marlow's sticks to the color platform on the cover. I love the text, its a nice size and up beat . 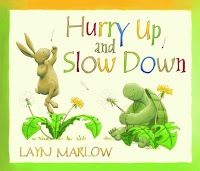 The text and colors make this book a great choice for a read aloud and young listeners. 3up. Enjoy the clip. I almost didn't recognize Mariah Carey. Warning there is language. Marcelo in the Real World by Francisco X. Stork Before I get to how good this story is, I am going to start with the cover. I picked this book up the day it came out because of Dan Mccarthy's beautiful and irresistable cover illustrations. 17yr old Marcelo has a mild form autism, classified has Asperger syndrome. Marcelo has difficulty with emotional connections. He refers to himself in the third person and calls his parents by their first names. He doesn't sleep in the house but rather a tree house which is equipped with electricity. Marcelo has been attending Paterson, a special school since first grade, where there is a routine and he feels comfortable. His father, Arturo believes Marcelo is ready to face the real world. He wants Marcelo to work at his law firm for the summer. If Marcelo does this for the entire summer, he can decide if he goes to Paterson or a public high school for his senior year. Marcelo accepts his fathers challenge. Stork has created a beautiful character in Marcelo, he is as three dimensional as they come. I love that the changes in Marcelo are gradual and he is willing to accept that maybe his father was right. This novel is young adult, but I have my fingers crossed that people won't use that has a reason not to read Marcelo in the Real World. Its a lovely story that shouldn't be ignored simply because of classification. A lot of times customers will come in and they won't know the name of what book they're after or they only have a partial title. Now it is up to the bookseller to help them remember. In order to do this we must call upon detective like skills. Detectives use these techniques with witnesses to extract more information or at least those I've seen on television. 1.When trying to help a customer recall a title, booksellers must use a calming and smoothing voice, and not be condescending in order to gain the customers trust. Doing so ensures the customer will share even the smallest detail that may lead to the discovery of the title. 2.When trying to help a customer recall a title a bookseller can't push. If a bookseller ask a customer a question twice, like Is it fiction or nonfiction? And the customer can't answer, the bookseller must move on the next question. It only frustrates the customer and turns them against the bookseller, and making it the booksellers fault the customers can't remember the book they want. 4. When trying to help a customer recall a title a bookseller must be encouraging and patient. Bookseller can't get angry. Bookseller must continuously tell the customers not to worry about not knowing the title. In doing this bookseller create a safe environment for the customer. Allowing them to remember what they thought they had forgotten. 5. When trying to help a customer recall a title a bookseller must search. No matter how wrong or small the clue is booksellers should type it into the computer. Customers like to see booksellers actively seeking their unknown titles. I've gotten lucky this way myself, and I know I can't be the only bookseller. So give it a go booksellers. * Booksellers should remember to ask the customer when the book was published. If they say five or six years ago. Booksellers should use their own judgement about continuing or not. However if the the customer says the book may be out of print. I highly advise aborting the search for the unknown title. The Kayla Chronicles by Sherri Winston Kayla is a young feminist who dreams of becoming a journalist. In middle school Kayla created the Speak club (Sisters Providing Encouragement And Kindness) Now its the summer before high school and Rosalie's, the best friend convinces Kayla to try out for the Lady Lions, the schools dance team. Rosalie is convinced the Lady Lions are prejudiced against flat chested girls. Once Kayla is rejected, the girls of Speak can take down the Lady Lions. Kayla is uneasy with the plan from the beginning but she goes through with it because Rosalie is a bully of a best friend. Kayla is very conflicted she loves who she is but she is also ready for a change. When Kayla joins the dance team, the members help her redefine what's feminism. Winston's created a nice character in 14yr old Kayla. A lot of girls will relate Kayla's struggle to figure out who she is, and wanting to begin anew in high school. Also Kayla's relationship with her best friend seems to be falling apart. I really enjoyed The Kayla Chronicles. The book includes some nice quotes from famous women, and its end goal is to bring girls together. There is a nice part towards the end when Kayla questions Rosalie why she wanted to take down the Lady Lions. "Rosalie, did you ever ask yourself, of all the make a name for ourselves projects we could have done to launch Speak why the first thing on our agenda was to take down the most poweful group of girls at the school?" In Mike We Trust by P. E. Ryan 15yr old Garth is still dealing will the loss of his dad, when his Uncle Mike, his dad's twin comes for a visit. Its been a year and a half since Garth dad died in a sailing accident. His mom had to sell the house, and the two moved into a small apartment. Garth relationship with his mother is strained, after Garth tells her he is gay, and her response is to put the conversation on hold. To keep his mom happy Garth promises not to tell anyone. Only other person who knows is Lisa, his best friend. Garth's mom non acceptance makes him easy pray for his smooth talking uncle. Mike is a scam artist moving from state to state making up fake charities. When Garth comes out to his uncle Mike, he is perfectly fine with Garth being gay. Garth craves and needs this adult acceptance. Mike uses this as a way to get Garth to help with different scams over the summer, even convincing him to wear old Halloween costumes. Garth bad judgement to tell lies didn't begin with his uncle but when his mom forced him to keep his sexual preference a secret. Some of the best parts of the book are when Garth watches movies with Adam, a new friend/possibly more They watch a Beautiful Thing, and Chinatown on separate occasions. Their conversations are well developed, the author doesn't push for an instant connection. In Mike we Trust is well told. Garth is a very likeable character. Though I wished he stopped believing in Mike sooner then he did. 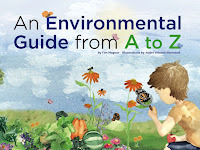 An Environmental Guide from A to Z by Tim Magner - This book is published by a small publishing house Green Sugar Press Their goal is to educate children about nature. This book is informative and enjoyable at the same time. Each definition is well researched. There are Did you knows? and questions inside of leaves, to encourage discussion. Magner is teaching not scaring. The author simply wants readers to be better informed so they can make smarter decisions. I love the fact that the author includes men who dared to care about the environment before it was the thing to do. Vincent-Barwood's illustrations blend easily with the text. 1. Jacques Cousteau invented scuba gear. 2. I'll share a Did you know? "With solar panels, Germany has nearly cut their use of coal in half. China installed 40,000,000 rooftop solar water heaters. Denmark gets more than 20% of its electrical power from wind farms." 3. Plankton is the floating food of the sea, not just a charcter on Spongebob Squarepants. Z is for Zoo, and yes zoo isn't has good has the other two. "Mrs. Homer is like, a hundred and ten years old. She can't recognize her own family members if they're standing right in front of her, screaming their names. She makes Helen Keller look like eagle eye. This is the person we trust to spot Osama?" "My mom used to have a sense of humor. I wonder if she noticed when it went missing. I rather like the idea of making a missing poster. It would show my mom laughing with a giant MISSING typed underneath with an offer of a reward"
Keeping Score by Linda Sue Park- This is one of those books I should have already read. (3 clues I missed) I remember when it first came it to the store last year, I was always looking at it and picking it up. The first clue but I didn't pay attention. The second clue the infamous 1951 Dodgers and Giants pennant race is part of the early chapters. The third clue was in the jacket flap, the author and I root for the same baseball team. I've learned my lesson, if I keep wondering back to the same book I will read the first page. Though I am very happy I picked this up when I did, Keeping Score got me out of my book slump. The two books previous I couldn't finish. The novel begins in 1951, 9yr old Maggie loves baseball and the Brooklyn Dodgers. Maggie hangs out at the fire station, listening to the Dodger games on the radio. One day Maggie goes to the firehouse there's a new fireman, Jim. He's a Giants fan but Maggie doesn't hold that against him. Jim teachers Maggie how to keep score. Maggie loves it, its opens up a new new world of baseball. As quickly as Jim arrived, he must leave, drafted into the Korean war. The two write letters. Jim's letters stop coming but Maggie keeps writing him. Maggie's father finally tells her Jim was injured and leaving with his sister, that's why his letters stopped. I loved Maggie and believed in her from the very beginning. Park's writing is beautiful and smooth. The novel spans four years, seasons change and world series are won. Baseball fans will love Keeping Score. Yes its about much more, including unstanding the Koren War but to get the rest you must enjoy baseball. Baseball is nothing without its history and Park gives us a lot of history. From Maggie listening to the games on the radio, to Willie Mays being drafted. If your a parent who shares the love of baseball with a child I highly recommend reading Keeping Score together. Ages 10 up.